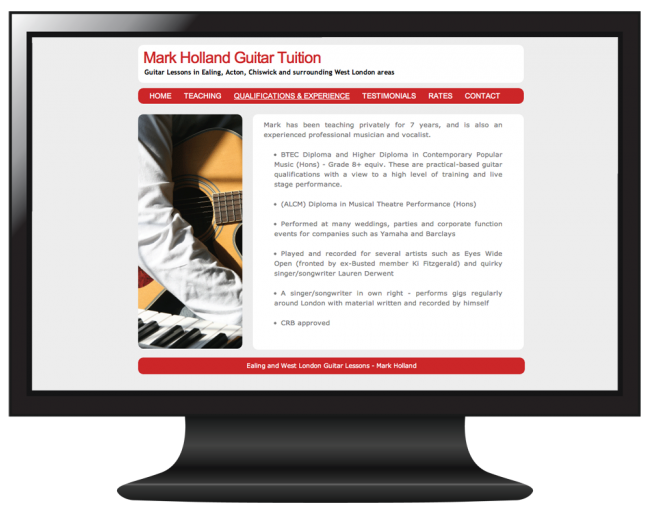 Simple website to clearly and effectively market guitar tuition services. Mark is an experienced teacher of the electric and acoustic guitar. He moved to Central London several years ago, and planned to become a professional guitar tutor to the local population. In order to market his services, he knew he would need to develop some form of web presence; using a mix of paid and organic searches to build a customer base. Mark asked us to create a simple site for him as quickly as possible. He didn’t have too many requirements, other than it should feature the colour red in order to tie in with his other marketing materials, as well as basic imagery and text content. The site would have a small number of static pages, with a simple purpose to provide clear information to prospective students. We worked closely with Mark to identify the content that would be most valuable to potential visitors. Fortunately, he already had a set of marketing photos that we could use on the site, which work well to demonstrate this capability. In order to provide flexibility for any future enhancements, we used a simple content management system to structure the site. We provided full details of how to manage the site to Mark so that he could update pages and images as and when required. We worked to ensure that the site was as search-engine friendly as possible, using keyword phrases, image tags, and of course, relevant content. In order to speed up the rate of enquiries generated by the site, Mark chose to use Google Adwords to supplement the organic hits received. We helped him to set up his Adwords account, and demonstrated the best ways to generate and refine ad campaigns in order to maximise the value generated by each click. The site and associated marketing campaign has proved to be very effective in generating enquiries and new students. The simplicity of the site instills a sense of trust and focus that could otherwise have been lost. The flexibility within the site has enabled Mark to add features to it as his business has grown, with a new section of testimonials providing further credibility to his product. "BrightPie understood exactly what was important for a website such as mine: informative, simple, professional-looking and search-friendly. In a short time they achieved all of these aspects and were able to implement or change anything that I asked without any problem or delay. I now receive more than enough business through the internet alone and I do not even need to advertise through any other channels."